Taxi drivers blocked traffic in Warsaw on Monday. 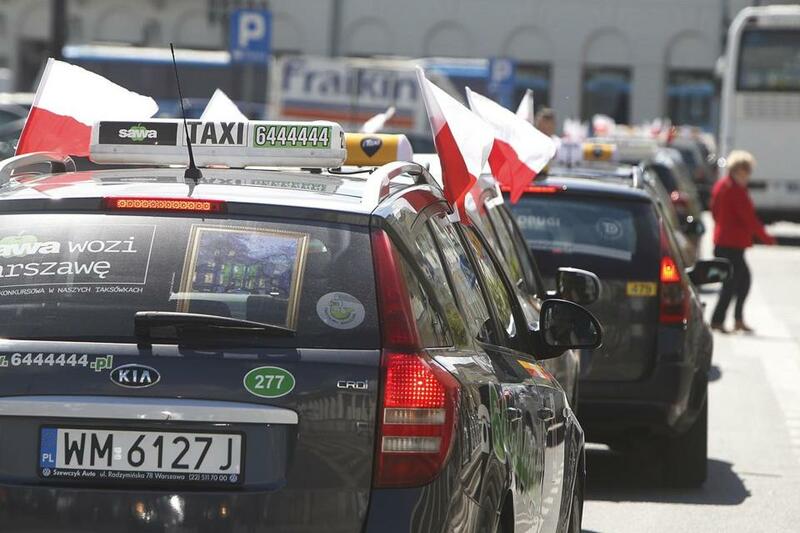 WARSAW, Poland — Hundreds of taxi drivers in Poland’s four largest cities drove at a crawl Monday blocking rush-hour traffic in a protest aimed at drawing the government’s attention to the rising number of unlicensed drivers who offer transport services. The taxi drivers say those unlicensed services, such as Uber and others, are a threat to their livelihoods and want the government to protect their authorized businesses. Advancing slowly in long lines, with Poland’s national white and red flags flying on their cars, they were to deliver petitions to the prime minister’s office and to the finance and infrastructure ministries. Their action drew some angry comments from bus drivers and those trying to get to work on time. Some 2,000 members were taking part in the protest, said Jaroslaw Iglikowski, the head of the taxi drivers’ union in Warsaw. Unlike the registered drivers, the unlicensed drivers produce no fiscal records for the tax offices and do not have to pass psychological tests, he said. ‘‘We want the government to react to the illegal activity of some transport groups,’’ Iglikowski told the Polish news agency, PAP. In addition to the demonstration in Warsaw, similar protests were staged in the cities of Wroclaw, Poznan, and Lodz. Earlier this year the government said it was working on a new law to regulate transport services, but gave no deadline for implementing it.